Wall Sconces are designed for hanging on any wall surface and are typically direct wired into an electrical box recessed into the wall. These sconces can replace any existing sconce. All necessary hardware is included. 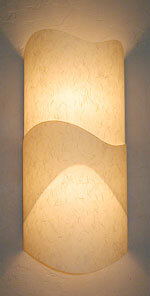 The paper is backed by a sturdy material used to make traditional lamp shades. (Also available: 6 ft. white cord with an on/off switch; be sure to indicate this preference when ordering.) 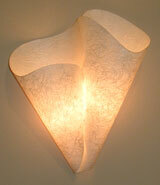 Sconces install in minutes. Instructions, hanging materials and bulb are provided. 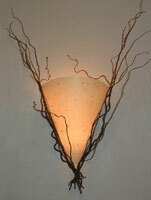 There are three main collections of wall sconces. See pictures below for visuals. Or, click individual images below to go directly to them.